Description: this General wears a dark grey jacket adorned with lighter grey spots and shapes and revealing a grey shirt underneath, as well as silver tags around his neck. He also sports a black utility belt, dark grey trousers and black boots. His pants and shirt sport some slight tears, like he’s had a run-in with an unpleasant dinosaur. He has brown hair and eye brows, black eyes and a rather grim look on his face. He stands in a very odd pose, left leg stretched forwards and right leg braced backwards, left arm reaching up and right arm pointing down, as if he's startled by some prehistoric vermin in front of him. He comes with a Dino Claw weapon,basically a large hand held contraption which ends in two comparatively small claws than can hook around dinosaur body parts. The claws are operated by a handle on its top side. The Claw is coloured totally black. The T-Rex stands in an active posture, its head curved to the left and its arms stretched out as if attacking something. The tip of the tail is bent, pointing upwards and to the left. It has small pads on its feet to give it extra support, though it still tends to fall over at times. While its underside (most of the lower jaw, throat, belly, arms, most of the legs, feet pads and lower part of the tail) is painted simply grey, the rest of the body sports a more intricate paint job. The upper jaw and face, neck, back, and top part of the tail are coloured in a very dark shade of brown (which at first glance seems black) with rounded stripes running out of this colour over the flanks, upper legs and sides of the tail. Vague regular brown colouring is applied around the edges of the darker brown colour, while lighter brown spots are found on the head, neck, flanks,upper legs and both sides of the tail. The Rex has white teeth and a red tongue and inside of its mouth, as well as small yellow eyes with black pupils. Its claws are not painted, but it has a black JP logo on each upper leg. Analysis: JP Dinosaurs 2 might have been able to do without them, but human figures are back for JP 2009 (Hasbro's, unfortunately). A more realistic approach is taken for their paint jobs, as illustrated by this Forest Hunter General and its camouflage army gear (maybe not enough green and brown for forest stealth, but still pretty concealing colours). His outfit looks gritty but fitting on him, much darker than his JPD2 predecessor and his more brightly coloured attire. He retains his idiotic and awkward posture though, which continues to hinder both his playability and his ability to stand up straight. His rocket launcher has been exchanged for what was formerly Alan Grant's grappling claw, still a silly and highly ineffective piece of equipment that looks overly complicated but works very simply (though, generally, not at all). Its new black paint job goes well with the General's sombre new look. The officer has a hard time holding on to it without falling over though, so it would have been preferable if either the weapon was made smaller (which shouldn't have been too hard considering less than half of the thing actually is of use to the clawing action) or the General's overall pose was adjusted, but Hasbro opted for the more simple solution of just not giving a damn. 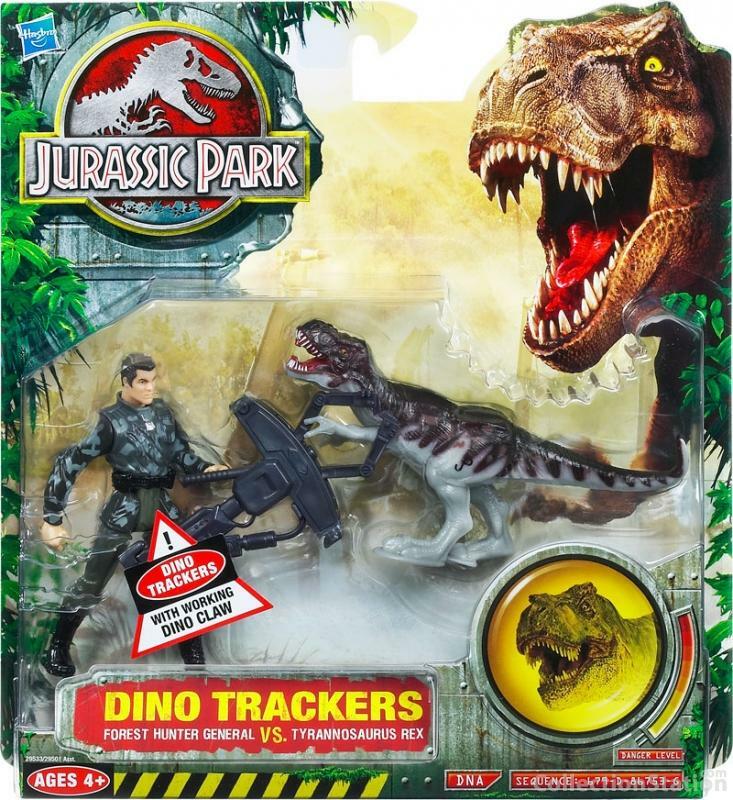 The military man comes with the same T-Rex whose presence dominates the four dinosaur two-packs of this line, making this its fourth appearance in JP 2009. Though its underside could definitely have used more work and detailing (painted claws and pads would have been appreciated), the upper half of its body features a pretty good new paint job, fairly detailed and original, complimenting the General's darker and grimier new look. Still, this is one sculpt we definitely don't need to see again, ever, and it would have been nice to see this human figure paired with another miniature dinosaur than its original counterpart, for diversity's sake. If they can give him another weapon, they can give him another dinosaur, but it seems we have to make due with the same line-up as before. Which means the General is dead meat, considering his lame Dino Claw is no match for this ravenous little Tyrant King. Repaint: yes. This set is identical to the Military General set of the JP III line, except for the weapon which originally came with JP III Alan Grant. The General has been repainted once for JPD2, while the T-Rex has already been repainted over a dozen times for Camo-Xtreme, JPD2 and JPD3 and would be used several times again for this toy line. The General would also make an appearance in the Deluxe Electronic T-Rex set of this toy line, with the exact same paint job. The Dino Claw weapon was also repainted for JPD2, and would be featured a second time in this toy line. Overall rating: 5/10. Not the best sculpts and accessory, but the paint jobs are fairly okay, certainly compared to some of the more zany repaints in this toy line. This set is not rare and can still be found with little effort. Since this set was a Toys'R'Us exclusive that could change over time, but probably not for the next decade.